In honor of the anniversary of Grant Wood's birth and death, this week the Daily Palette is celebrating his achievements through four works of art that span his career. All four works are owned by and currently on view at the Cedar Rapids Museum of Art in the ongoing exhibition, "Grant Wood: In Focus." Images courtesy of the Cedar Rapids Museum of Art. Grant Wood (February 13, 1891-February 12, 1942) is Iowa's most famous artist and one of the most celebrated American artists of the twentieth century. He was born near Anamosa, but spent most of his life in Cedar Rapids. Wood developed an interest in art at a young age, and later advanced his skills at the Minneapolis School of Art and Design, the Art Institute of Chicago, and the Académie Julian in Paris. While he worked in an impressionist style early in his career, he is best known as an American Regionalist. One of the three major Midwestern Regionalists, a triumvirate that also included John Steuart Curry and Thomas Hart Benton, Wood was devoted to painting the people and landscape of his home state. While some of his paintings have been criticized as satires of rural life, it is clear that he celebrated Americans and Midwesterners alike through his art, his collection of Americana, and his interest in Midwestern history. While Wood is best known as a painter, he worked in a variety of media throughout his career and had a strong interest in the Arts & Crafts movement. Early in his career he worked as a metalsmith at the Kalo Shop in Chicago and soon after he founded the Volund Crafts Shop with his colleague Kristoffer Haga in Park Ridge, Illinois which was open from 1914-1915. 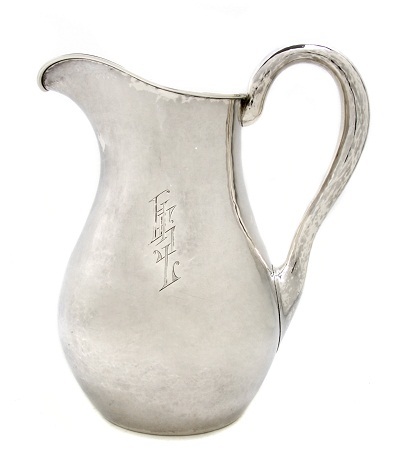 Volund Shop Silver Pitcher is one example of Wood's work in silver from this period of his career.